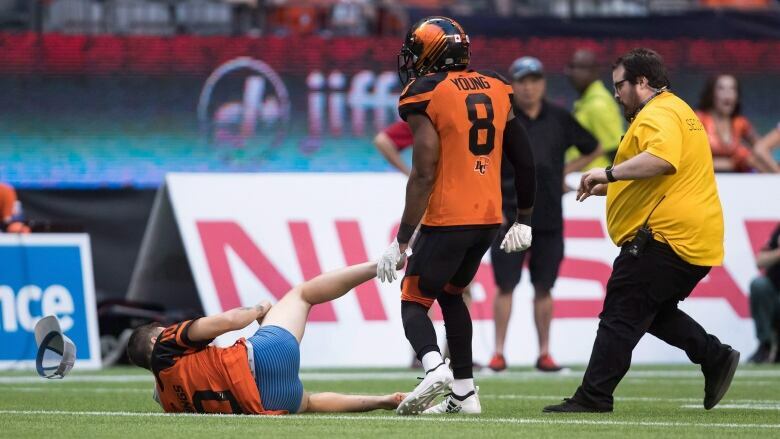 The pantless man who was knocked to the ground by a player after he ran onto the field during a B.C. Lions game has retained a law firm that specializes in personal injury claims. In a release, Preszler Law Firm says "our client suffered serious injuries, including a mild traumatic brain injury, as a result of being struck violently by B.C. Lions player Marcell Young." 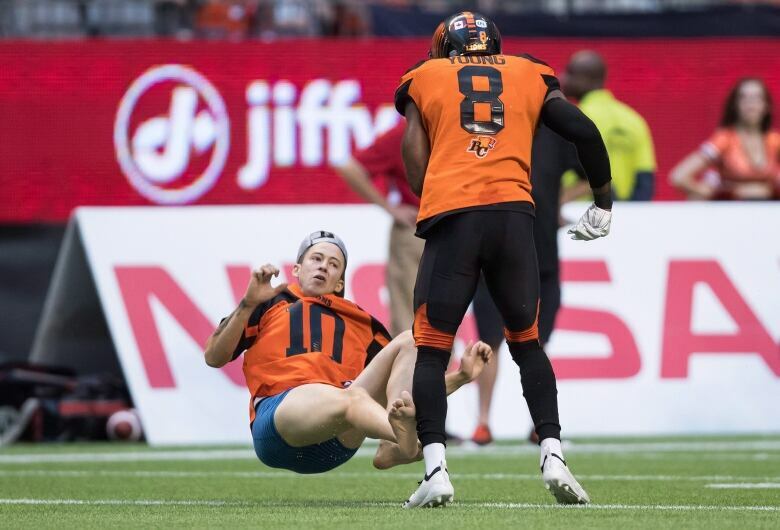 The man, who police say is from Surrey and in his 20s, was wearing only blue underpants and a Lions jersey when he took to the field at B.C. Place during the first quarter of the game against the Montreal Alouettes on Saturday. He ran around the field waving his arms and twirling before being knocked to the ground by Young. Stadium security guards escorted him off the field. The man, who police say was intoxicated, was not charged criminally but was issued a $115 fine for trespassing and banned from B.C. Place for one year. A spokesman for Preszler Law Firm said their client did not want to be identified. The B.C. Lions and B.C. Place Stadium declined to comment. An earlier version of this story said the man was transported to the VPD jail. Police have since revised their statement and say he was released on site after refusing the offer of an ambulance.